1852722 Sergeant (Rear Gunner) Kenneth Ernest Charles Adams of the RAF VR, 51 Squadron. Son of Miriam and Alfred Adams. Born in Leek in the March Quarter of 1925. Died 19 August 1944 aged 19. He was a crew member in Halifax MZ 581 which took off from RAF Snaith at 23.02 on the night of 20/21 July 1944, detailed to bomb Bottrop in Germany. Nothing more was heard from the aircraft after take-off. At the enquiry, a survivor reported that the plane was hit by flak over the target area and the rudders were severely damaged. Soon after this incident, the plane appeared to collide with another aircraft but somehow, the pilot regained control and a course was set for Woodbridge, Suffolk. Somehow they made it back to England but on approach, collided with trees and crashed near the runway, killing three of the crew. The accident report concluded that the collision with the trees resulted in almost total loss of control and that the pilot had made a gallant attempt to bring the damaged aircraft back safely. It was further suggested that the crew should have bailed out before attempting a landing. 161085 Flying Officer (Pilot) Kenneth Albert Ayres of the RAF VR, 153 Squadron. Son of Albert and Evelyn Ayres of South Molton; husband of Joan Ayres also of South Molton. Born in South Molton in the June Quarter of 1920. Died 13 March 1945 aged 25. After a mine-laying mission in Halifax? Lancaster? Mosquito? RA 526 (P4- 2ndj), Flying officer Ken Ayres and his entire crew were posted missing. It transpired that they had crashed near the island of Sanso, Denmark where five of the men are now buried. The body of the navigator, Flight Sergeant McMinn was never found. Pilot Officer Bob Maine (Bomb Aimer|) parachuted to safety but was caught and made POW by the Germans, eventually being released by the Americans. D/MX 51983 Leading Cook Derrick George Brayley of the Royal Navy, HMS Gloucester. Son of James and Eliza Brayley of South Molton. Born in South Molton in the December Quarter of 1917. Died 22 May 1941 aged 24. HMS Gloucester sank in the so-called Battle of Crete. Rumour has it that as they left the ship for the last time, all the men left their shoes behind on the deck. 807 men died - the remaining 85 were picked up by the Germans and imprisoned. After the war, they founded the "Fighting G" Club - the next annual reunion takes place in Plymouth on May 26/27 2012. 139960 Flying Officer Sydney George Burnham-Richards of the RAF VR. Son of Frederick and Lilian Burnham-Richards of South Molton. Born in 1922. Died 9 October 1943 aged 21. 521488 Private Robert James Boucher of the 1st Battalion, the Devonshire Regiment. Son of John and Alice Boucher of South Molton. Born in South Molton in the June Quarter of 1919. Died 6 February 1943 aged 23. D/JX 127853 Able Seaman Reginald Ernest Edward Boucher of the Royal Navy, HMS Gloucester. Son of William and Mary Boucher. Born in Warkleigh in the September Quarter of 1910. Died 22 May 1941 aged 31. 921703 Lance Bombardier Harold Discombe of the 142 Field Yeomanry ( Royal North Devon Yeomanry). Son of Simon and Emma Discombe; husband of Ethel Discombe. Born in Crediton in the December Quarter of 1910. Died 9 September 1943 aged 32. 915651 Gunner Kenneth Alfred Dymond, attached to HQ X Corps,, the Royal Artillery. Son of George and Emily Dymond. Born in Torrington in the September Quarter of 1920. Died 28 June 1942 aged 23. 413618 Gunner Thomas William Friendship of 473 Batery, the 11th Battalion, the Light Ack Ack Regiment, the Royal Artillery. Son of Thomas and Ada Friendship of South Molton. Born in South Molton in the June Quarter of 1914. Died 24 July 1943 aged 29. D/K 6102 Stoker 1st Class George Henry Grant of the Royal Navy, HMS Courageous. Husband of Gertrude M. Grant DBE of South Molton. Born in Barnstaple in the June Quarter of 1889. Died 17 September 1939 aged 50. 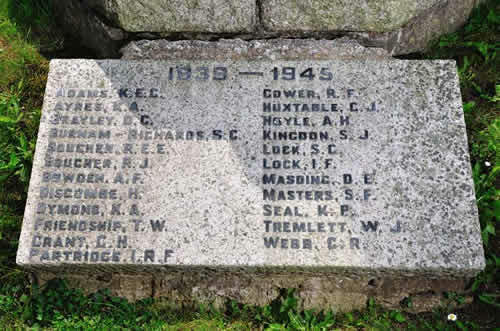 HMS Courageous, an aircraft carrier, was attacked by U-boat 29 and sunk.The number of casualties varies according to the source but there were survivors. 5444849 Private Ivor Roy Frank Partridge of the 5th Battalion, the Dorsetshire regiment. Son of Charles and Clementine Partridge of South Molton. Born in South Molton in the March Quarter of 1922. Died 20 July 1944 aged 22. 40693 Pilot Officer Richard Francis Gower of the RAF, Son of Herbert and Ethel Gower of Cromer, Norfolk. Born in Bourne, Lincs in the June Quarter of 1916. Died 11 August 1949 aged 24. 120702 Major Charles John Huxtable. Son of Charles and Elizabeth Huxtable of South Molton; husband of May Huxtable also of South Molton. Born in South Molton in the June Quarter of 1906. Died 24 October 1945 aged 39. 4693691 Signalman Alfred Hedley Hoyle of the Royal Corps of Signals; attached to the 44th Indian Armd. Div. Sigs. Indian Signal Corps. Son of frederick and Gertrude Hoyle. Born in Rotherham in the December Quarter of 1919. Died 27 August 1944 aged 24. 1097768 Sergeant (Navigator) Sidney James Kingdon of the RAF VR. Son of Sidney and Mary Kingdon of South Molton. Born in South NMolton in the September Quarter of 1921. Died 15 April 1945 aged 24, . Buried in South Molton Cemetery. His Lancaster took off on a cross-country training mission at 14. 55 on 15 April 1945.. Suddenly it was seen to nose-dive. As the aircraft hit the ground it broke up and all the crew were killed. 909891 Staff Sergeant Sydney Charles Lock of the Royal Artillery, 142 Field Regiment (Royal North Devon Yeomanry). Son of Henry and Mary Ann Lock of South Molton. Born in 1918. Died 9 September 1943 aged 25. D/JX 258773 Ordinary Telephonist Ivor Francis Lock of the Royal Navy, HMS Trinidad. Son of Mrs E, Lock; husband of Winifred Lock of Dorchester. Born in South Molton in the March Quarter of 1914. Died 14 May 1942 aged 29. W/59792 Private Dinah Esther Masding of the ATS, attached to 435 Battery, the Heavy Ack Ack Regiment, the Royal Artillery. Dughter of Arthur and Hilda Masding of South Molton. Born in Barnstaple in the September Quarter of 1921. Died 7 August 1942 aged 21. Buried in South Molton Cemetery. 4133370 Trooper Sidney Francis Masters of the 5th Battalion, the 18th Regiment, the Reconnaissance Corps. Son of Francis and Maud Masters. Born in Holborn, London in the September Quarte of 1909. Died 14 February 1942 aged 32. Commemorated on the Singapore Memorial. Believed to be Katherine P. Seal, the daugher of Philip and Annie Seal who was born in South Molton in the December Quarter of 1913. No information about her military career is yet confirmed. 5630913 Private William John Tremlett of the 1st/4th Battalion, the Hampshire Regiment. Son of John and Winnie Tremlett; nephew of Mrs. W. Brown of South Molton. Born in Barnstaple in the June Quarter of 1923. Died 16 September 1944 aged 21. 5336765 Lance Corporal Charles Reginald Webb of the 1st Battalion, Queen's Own Royal West Kent Regiment. Son of Charles and May Webb. Born in West Ham in the December Quarter of 1920. Died 9 November 1944 aged 24. 852373 Sergeant Albert Fred Bowden of the 142 Field Regiment (Royal North Devon Yeomanry). Son of Albert and Winnie Bowden. Born in South Molton in the December Quarter of 1918. Died 5 April 1941 aged 22. Buried in South Molton Cemetery. 5612904 Private Frederick Charles Dennis of the Pioneer Corps. Son of Alfred and Mary Dennis of South Molton; husband of Beatrice Dennis of Barnstaple. Born in 1906. Died 4 February 1946 aged 40. Buried in South Molton Cemetery.